Wearable tech is one of the buzziest buzz phrases going these days. So in a world where major multinational companies are investing heavily in glasses, bracelets and other gadgets, you've got to give credit to a little shop that manages to grab a ton of attention. And that's exactly what Central Standard Timing has done on Kickstarter. Its CST-01 is a big hit, and not because it promises a ton of microscopic functionality on a teeny weeny screen. Quite the contrary. 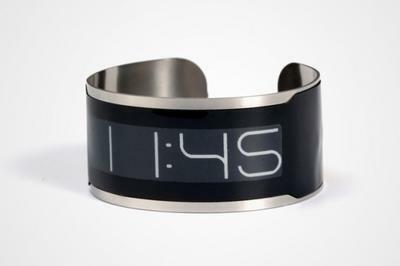 This super-sleek item features a huge e-ink display fronting what it claims is the world's thinnest watch. Even more impressive is that all this interest is being showered on a singletasker. That's right, the CST-01 does only one thing — tell the time. But oh, how stylishly it does that. This gorgeous watch is only 0.8mm thick, made up of a super-thin band of steel with a 0.5mm groove, carved to fit the barely-there electronics, and a curved display. That screen winds up being key. Since it's e-ink, powering it doesn't take much juice. In fact, nothing on the the CST-01 takes a big hit on the battery. There are no smart functions of any kind, not even an alarm — which is somehow charming in these notification-ridden, alert-blaring times, no? When do you have to top it up, you just place it on the inductive dock (which also happens to set the time). All it takes is 10 minutes to fully charge it, and it lasts for at least a month. The longevity is even epic, at around 15 years. There's still time to get in on this. After just a week and a half, its CST-01 watch got well over twice its original goal of $200k. And there's still over a month to go. Unfortunately, the early bird and beta deals are already sold out, but there are more options available. When it goes retail, the watch will cost $170, but it's only $129 now, and you get one CST-01 plus a charging dock in your choice of color (white or black). Want to share a dock with a roommate or spouse? Then go for the $229 option, which comes with a white version, a black version and one dock. The campaign will end February 22, and delivery is expected in September. To learn more about the watch, hit the video above or check it out at the Kickstarter page.